Dr. Robert Braun of the Georgia Institute of Technology is NASA's new chief technologist. NASA hopes to jumpstart its new direction in space exploration by refocusingon transformational technologies, and the agency has a new tech guru to helplead the way. As part of the shakeup, NASA administrator Charles Bolden named Robert Braunas the U.S. space agency's new chief technologist. 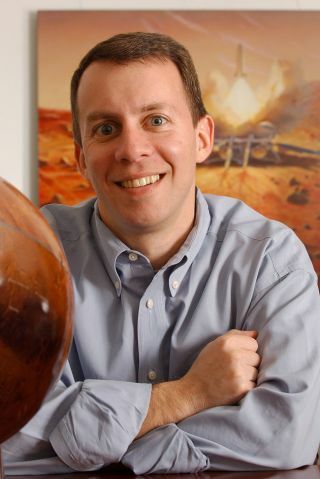 Braun is currently anaerospace engineering professor at the Georgia Institute of Technology, butreturns to NASA after spending 16 years working on roboticspace exploration at the NASA Langley Research Center in Virginia. SPACE.com: So what's your job as NASA's new chief technologist? Braun: As chief technologist, I report directly to the NASAadministrator. I'm his principal advisor and advocate concerning matters oftechnology across the agency. I consider what types of technology the agency should pursue, what are theproper investment strategies, what are the appropriate mechanisms for engagingthe larger aerospace community, what kind of partnerships should we establishwith other government agencies, and how to best invest NASA's technologicalcapital on the significant needs facing society today. I'll be directlymanaging a new space technology program that invests in early-stage and game-changingtechnologies for future application in NASA missions or other nationalneeds. S: How has NASA's shift in space exploration changed its emphasis ondifferent areas of technology? B: Previously NASA was marching toward a single human explorationfuture, if you will, where it was leveraging Apollo and Shuttle technologies toreturnto moon. When I think about the future now, I see a lot of possibilities. I seehumans going to moon, to the asteroids, and eventually to Mars. I see roboticexplorers traveling throughout the solar system and eventually intointerstellar space. I see the possibility of identifying life on other planetsand exploring worlds around other stars. I see an Earth observation system that can accurately forecast the emergenceof major storms and natural disasters. I see NASA supporting an emergingcommercial spaceflight industry and being a significant contributor to solvingour nation's technological needs. In my opinion, through a focus on innovationand technology, NASA's new strategy is much more likely to accomplish thesepossible futures. To me, that's extremely exciting. As a university professor,I imagine young people all around the country may feel the same way. There are several major tenets to this strategy. One is to fully utilize theInternational Space Station [ISS]. This human spaceflight laboratory is now amajor piece of our human space exploration strategy. We're going to fullyutilize the ISS to learn what it takes to send humans beyond low Earth orbit.To me, that's one benefit of the new approach. In addition, we will focus onthe development of game-changing technology and early-stage innovation. NASA isgoing to cast a wide net for the best ideas from industry, academia, NASAcenters, or partnerships with other agencies. These innovations will enable thedevelopment of new approaches to our current mission set and allow us to pursueentirely new missions for the country. S: What transformational technologies are needed to realize NASA's goalsfor robotic or human space exploration? B: I'm going to be in a position where I'm responsible for theselection of some of these things, and so I can't tip my hand. But in general,we clearly need better materials. We clearly need more lightweight structures. We perhaps need more inflatable habitats or technologies which could be usedto get around the limitations of existing launch vehicle volumes. We needadvanced propulsion for heavy lift, but also for in-space transportation.In-situ resource utilization ? we need to learn how to live off the land, so tospeak, at the moon and Mars. S: What destinations or goals would you like to see for NASA's roboticmissions in the near future? B: First of all, I started out with NASA because I was interested inhuman Mars exploration. My first job at NASA Langley was to figure out how tosend humans to Mars and land them safely. I worked with the first PresidentBush on his space exploration initiative. I honestly thought we were going toMars, when I was right out of college as a young engineer. When humanMars exploration fell apart, I worked with the Jet Propulsion Laboratory onsending out a variety of landers to the surface ofMars. The technological challenges of that alone were significant. I learnedhow hard it is to land even small rovers on Mars. NASA's been getting better atthat, leading up to the Mars Science Laboratory that will land around 2012. I'd like to see us continue on the scientific pathway we're on. It startedout as follow the water, then became follow the carbon, and there's no doubtthe Mars program is on the path to one day address the question of life. Ithink that's really exciting. Was there life onMars, could there be life in Mars? Those questions have major implicationsfor our society and our world. The ramifications are pretty significant regardlessof whether the answer is yes or no. In parallel to that, I think we need to start working on human precursormissions. If we want to someday send humans to Mars ? and I do want to sendhumans to Mars ? we need to know how to land the really huge payloads neededfor human exploration. If you think of the Mars Science Laboratory as a smallcar, humans need a two-story house. That's a big leap. S: Are there any overshadowed technologies that people don't typicallythink of as important for space exploration? B: As you're probably aware, there's been a revolution in IT[information technology], robotics, nanotechnology, and in bio-inspired design.The reason I'm excited about those three or four topics is that there's a hugeresearch world centered on those topics outside NASA. In academia or industry,people want to invent the next Internet, or the next big Internet application.What we need to do is tap into those innovations that are occurring outsideNASA and bring some of those innovations inside NASA. S: Do you think NASA has not looked to outside innovation so much in thepast? B: I left NASA in 2003, so I've been outside the agency for the pastseven years. As an outside observer, it appeared to me that NASA was all about"let's go to the moon with existing systems, let's build what we can nowto get there." Given the budget and schedule constraints they were workingwithin, this was likely the only viable approach. However, this also meant that NASA had to forego any substantial technologyinvestments. While I do believe this nation needs to go back to the moon, Ithink America's plan should be bigger than that. In order to get to a range ofother destinations and accomplish other missions, a significant technologydevelopment effort is required. America should be about innovation. America should be about pushing theboundaries scientifically and technologically. If we are going to send humansback to the moon and one day on to Mars, I'd like to think of us taking atechnological approach that's economically viable. The NASA administrator announced the other day that seven companies aregoing to compete for commercialaccess to space. In what other nation in the world could that happen? S: Do you hope NASA can create more spin-off technologies that privatecompanies can license? B: That is definitely a big part of the greater goal, to spin in andspin out technologies. I'm interested in spinning off NASA technologies to usein applications that help solve national needs. I think it's true that thespace program has always been a very good investment for America, for a numberof reasons. One, I think it's inspiring. It's a great model, an inspirational model, andit draws in a lot of young talent to related technological fields. There's alot of commercialization potential and partnership potential that started ingovernment and transitioned to industry. Over time, through the new spacetechnology program, a number of new businesses could be created ? in theory,whole new industries. S: What new technology investments do you think will have huge benefitsfor Earth as well as space exploration? B: The area where NASA could perhaps lead ? an area which couldaffect society greatly ? is robotics. NASA is doing amazing things in bothrobotics and human exploration assisted by all kinds of autonomous systems.There's a large number of applications right here on the ground that willbenefit from NASA research in that area. S: What personal gadgets do you like? B: I like all gadgets. When a new gadget comes out, I'm not usuallythe first one to get it. Being a university professor, I have engineeringstudents around all the time who love technology. I basically watch them. Thisis an example of them teaching me. So when the students came out with all thesocial networking stuff, I learned about that from students. When the iPhone came out and was all the rage on campus, I learnedabout that from students.